Now that I have my full complement of tongue-and-grooved ply, I thought I'd make a start on the dwelling roof. But before I could start that, I needed to make safe the space around the walls since I'll be trafficking around here quite a lot. 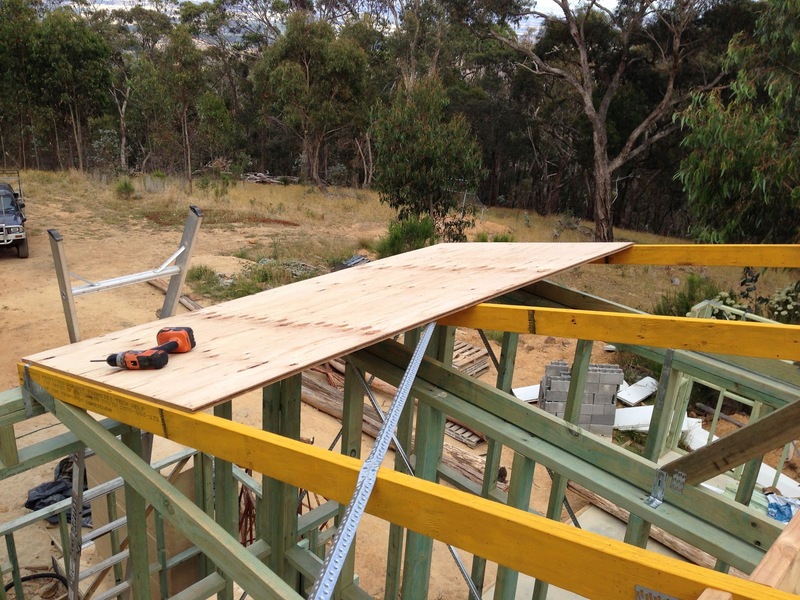 First off, I needed a safe platform at the corner of the building above the battery / pump room - not only to install the roofing, but I'll need it when I come to put the Hebel in place. A few 90x45 bearers and the top (scrappy) sheet of ply and bingo, a safe work space. 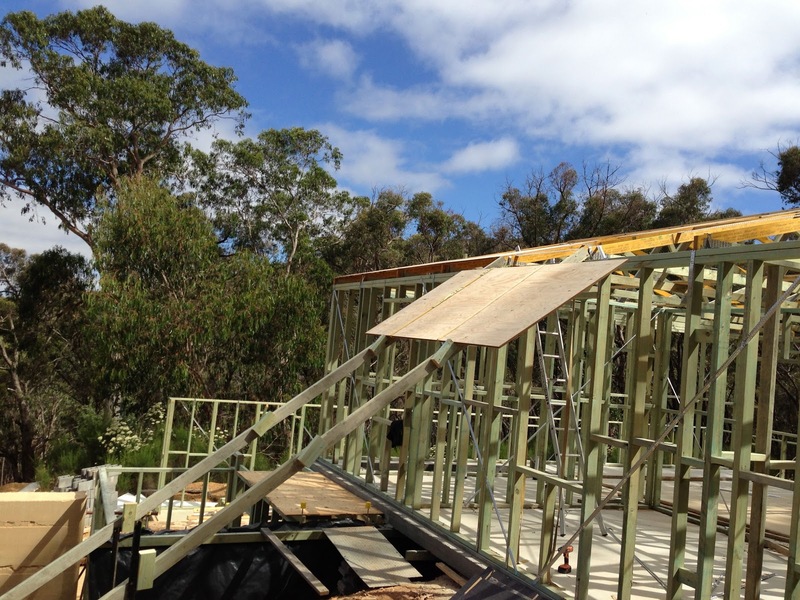 Now, the first sheet of ply I lifted onto the roof using a ladder - if only to see if I could, or whether I needed another system. I did get it up without injury or mishap, but I'd not like to lift 40 of the buggers this way, so I spent a few minutes exercising the brain. What I came up with is a very similar process to that which I used to skid the trusses up to the top plates - a couple of long 90x45 lengths anchored to star pickets, but this time I included a couple of "stops" to allow me to rest during the lift. These are just offcut blocks nailed to the skids at an angle, resulting in a "sawtooth" which allows me to slide the sheets up easily, but once over the block they won't come back down. Clever and simple little system! I like how each step throws up its own problems that need solving before moving on. Its great to see the project looking more and more house-like. Oh - and Happy New Year!